The challenge we pose is how do the nanoscale oxide structures in these materials develop, and what are the kinetics of oxidation at different stages that bridges the meso and nanoscales. The high temperature behavior of MoSiB alloys has been widely studied in the last decade due to the attractive alloy properties of high strength, creep resistance and phase stability that offer new capabilities beyond those that are possible with superalloys. 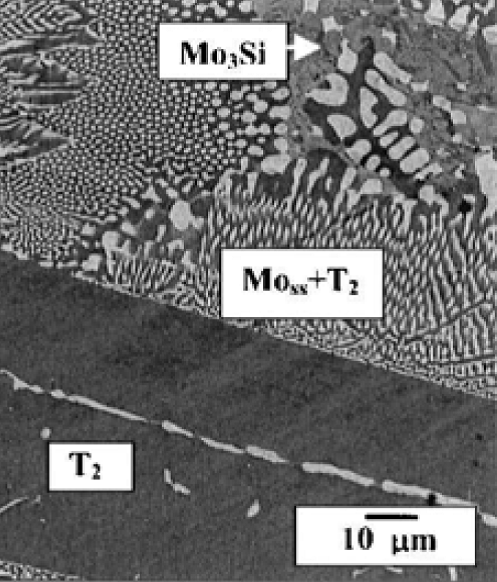 The three-phase MoSiB alloys composed of Mo solid solution [Mo(ss)], Mo3Si (A15) and Mo5SiB2 (T2) phases as shown on the right. Following primary phase solidification the liquid composition tracks the liquidus surface with cooling until a twofold saturation path is reached that yields both Mo(ss) and the T2 phase. Upon further cooling the liquid composition reaches the ternary eutectic reaction, L -> Mo3Si + Mo(ss) + T2, for final solidification. For as cast alloy, the Mo(ss) phase represents 0.45 volume fraction of the Mo(ss)+T2 eutectic region, and ~0.2 volume fraction of the overall microstructure. The Mo3Si phase can be suppressed by rapid solidification. After proper treatment (e.g. annealing at 1600 C for 25hr) Mo(ss) can precipitate in the T2 primary phase, indicating supersaturation can be retained within the T2 matrix. MoSiB exhibits accelerated oxidation at relatively lower temperatures (650-750 C) before steady, slow oxidation at above 800 C. The oxidation mechanism of MoSiB has two distinct stages which have been identified (albeit only at the mesoscale) during isothermal oxidation in dry air as illustrated on the left. 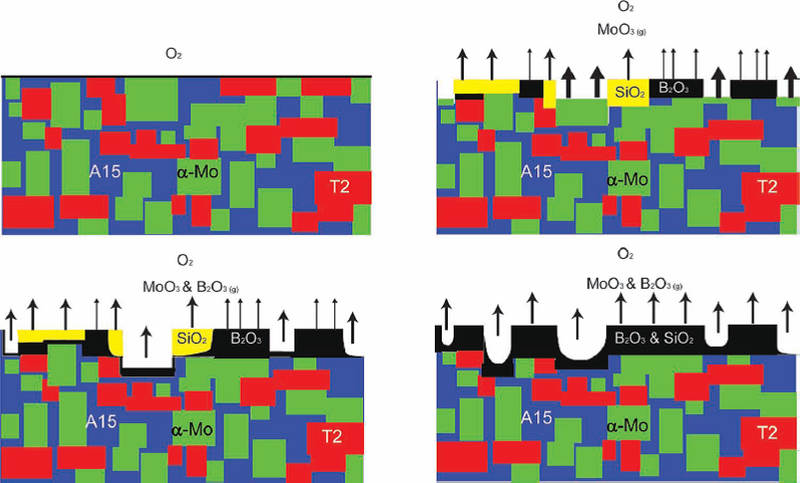 Initially, there are concurrent reactions between the molybdenum and oxygen to form MoO3, which starts to sublime above 475 C, and oxidation of the boron and silicon from the A15 and T2 phases to form a silica and a borosilica product, respectively. Above 750-800 C the borosilica reaction product becomes continuous and slows down the oxidation and recession of the substrate. Between 650 and 750 C the borosilica is not continuous and oxidation will lead to a complete transformation into powder due to the loss of MoO3 and the penetration of MoO2 at interphase interfaces.